While some of the higher-end restaurants and shops take credit cards, most do not. Even if shops do take cards, the chances of you bargaining for lower price are drastically decreased if you’re not offering cash. Not only that but you need cash for transportation, whether it be in pedi-cab, horse drawn carriage, or taxi. Lastly, during your time in Marrakech you may experience certain situations that require you to dole out cash (more info to follow). A scared little tourist is very likely to attract attention, whether you want it or not. 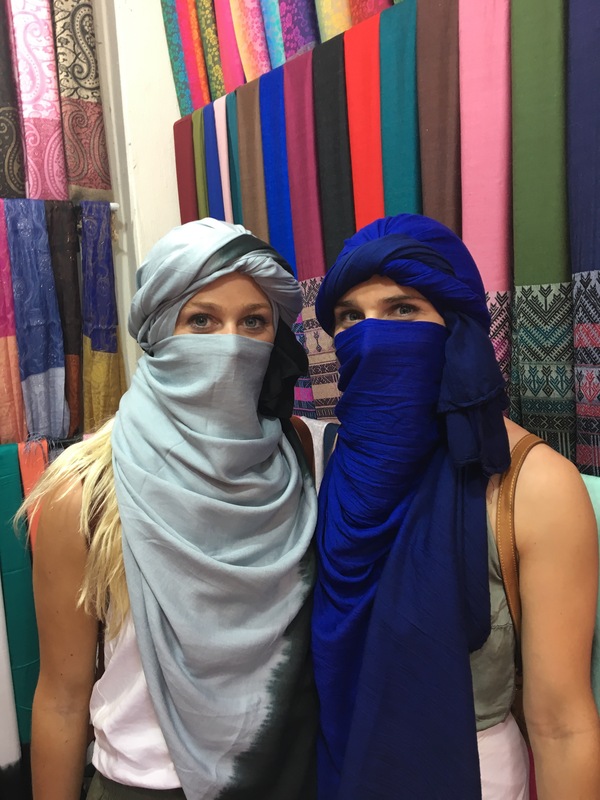 Hannah and I experienced this first hand our first evening in Marrakech, just walking from our riad into the crowed bustling streets toward the Big Square. Being in a new place with herds of people pushing coupled with our parents’ unwarranted panic attack (more on that later), we were a little nervous and it showed. Everyone was asking us if we needed help or a place to stay or directions to the Big Square and it was pretty overwhelming. We immediately noticed a difference the following day, traveling the same route at the same time. We felt more familiar with the old city and knew where we were heading, which was reflected in our demeanor; no one spoke to us. If you do accept directions from a seemingly friendly local you may subsequently be asked to pay for their services, however brief. While there are a plethora of posh hotels in the city, the alternatives offer an all around better experience. 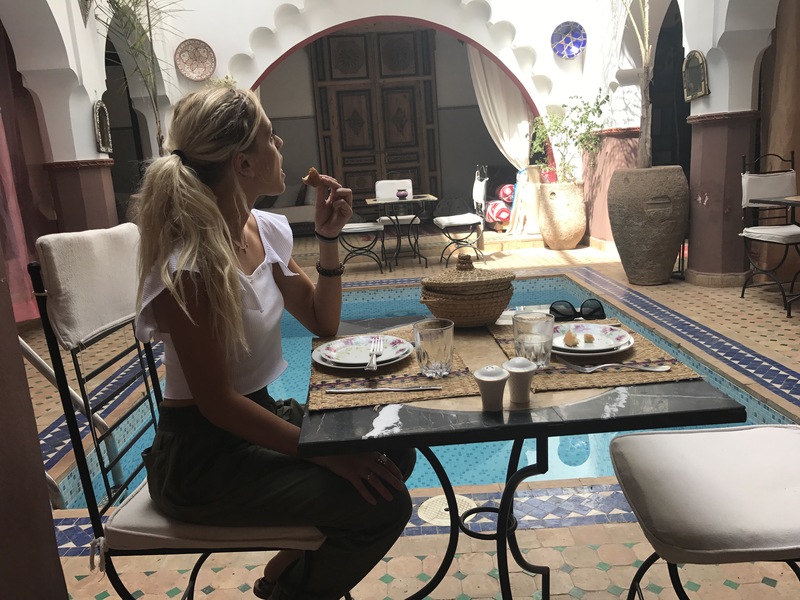 Not only are they more cost effective (ours was only USD $35 a night, with free breakfast) they also are more authentically “Marrakech.” You are able to develop a personal relationship with the staff, who can connect you with the right people while in town. Check out Airbnb.com first, but Tripadvisor.com is also a great place to scope out Riads. If you haven’t visited Marrakech before it will be next to impossible to try to find your own way to your riad. Many of the streets are not accessible by car and there are so many different off shoots, your driver is sure to get lost if they are not familiar with the riad ahead of time. To avoid a blind leading the blind situation, have someone from the riad pick you up or have them get you a car. We had the owner of our riad fetch us and it saved us from retelling you a horror story (we heard a lot). An airport pickup could cost between $15 to $20 USD and it is so worth it. There is also a bus that goes from the airport to a few stops in the city, one being the Big Square (about $5/person). The bus is not worth the risk, but you can use it as leverage if you want to try your hand at negotiating. Price negotiating is expected and encouraged for almost everything: tours, food, transportation, goods, and other services. Hannah has become an expert negotiator throughout our travels. In Marrakech, we bought what they store referred to as “Rolls-Royce of carpets” for 20% of the asking price. 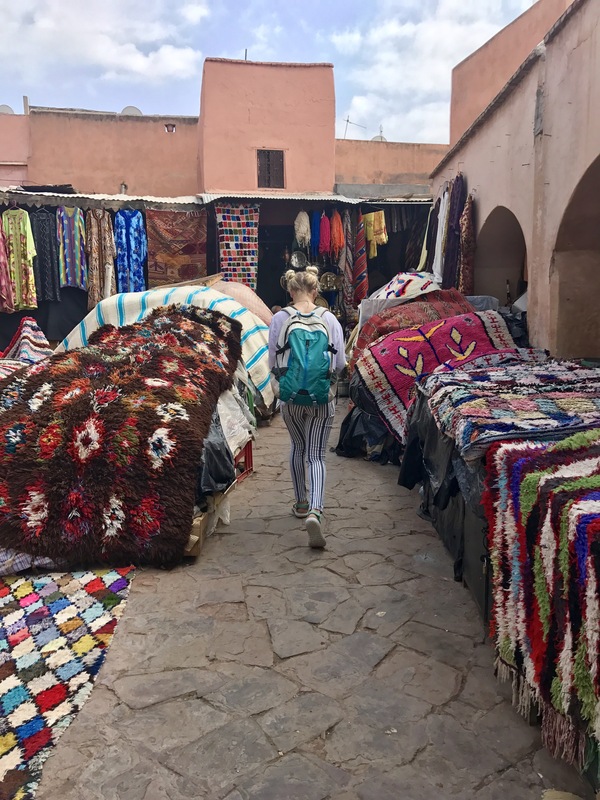 Our guide later told us that the salesman lightheartedly complained that we bartered better than the Berber people (in Arabic, so we didn’t know). Here are some of her best tips: 1. Stay calm, it can be tense situation but if you stay cool it can be rather fun 2. Immediately low ball them, lay out a price that is a fraction of what you would actually want to pay and work from there 3. Try a bundle deal, if you want a necklace tell the shopkeeper you’ll pay a good price for it but you also want a pair of earrings thrown in. Want more info on the negotiating process? Lmk and we can create a post, but it is a skill best learned through practice. Find a guide to take you around, preferably on your first full day in the city. We had a guide recommended to us by Hannah’s yoga teacher. He was a wealth of knowledge, pleasant to talk with, and best of all he takes you to the places that are truly Marrakech and not a façade cultivated to fulfill tourist expectations. We never do tours or hire personal guides, but Mohammed was so great that had we planned correctly we may have hired him for a second day. Let me know if you’d like to be connected with Mohammed, he is ready to take you on a tour! Appropriate and respectful dress is not required in most public places but you should still leave your booty shorts at home. Generally speaking, we recommend having your knees and shoulders covered, for both women and men. 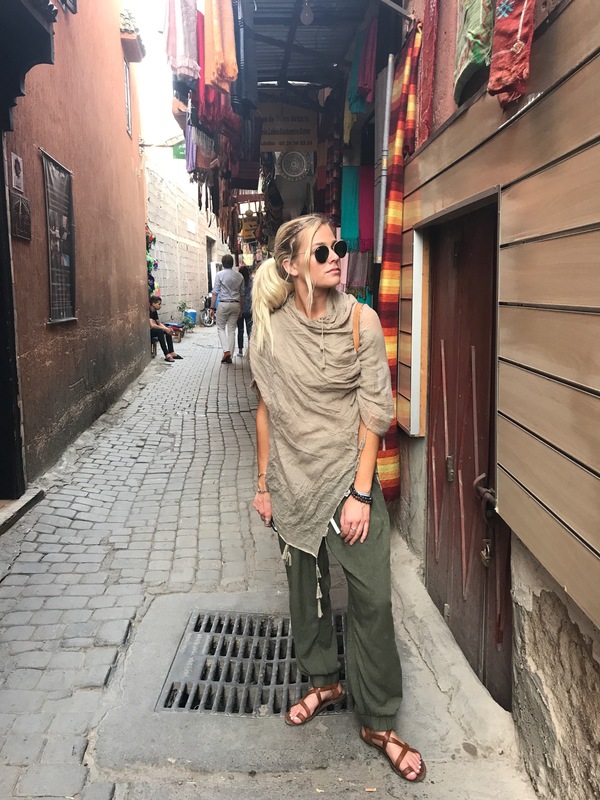 Check out our post on How to Dress for Marrakech (coming soon!) for more specifics. 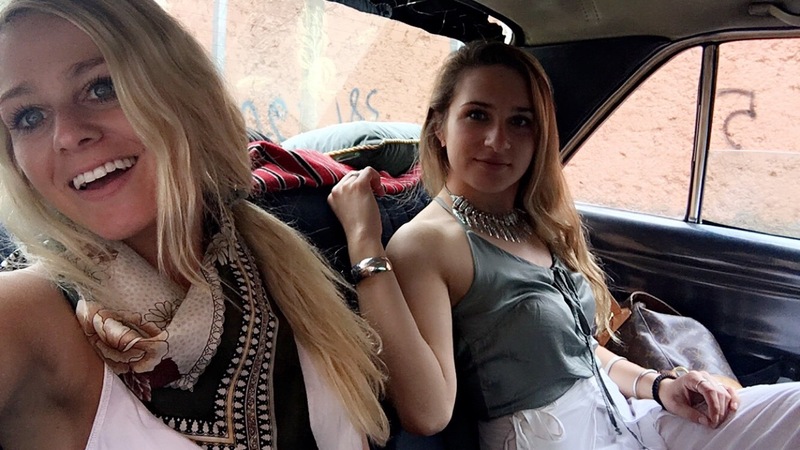 Marrakech is like any other touristy city; its home to good people but also bad people. There are people who will remind you not stick your phone in your back pocket because of the other people that might take it. Be aware of your surroundings, but you do not need to be on edge because you feel like you’re constantly being threatened.